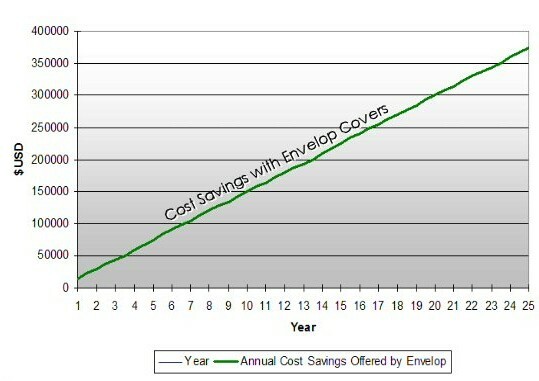 The following chart illustrates how the use of Envelop Protective Covers can save an enormous amount of money over the course of 25 years. Replacing JUST ONE traditional 25MM Gun cover with an Envelop Protective Cover saves you $30,020 by the end of the second year. The savings after 25 years adds up to $374,000 and that’s just for one cover. Imagine how much money could be saved by replacing all traditional covers with the superior technology of Envelop Protective Covers. Given these assumptions, the $32,500 will result in savings in constant dollars of $374,000 over 25 years. An investment of $2,500 for 1 Envelop cover will save $30,200 over two years. The cost of the Envelop cover will be recovered in 68 days. Envelop 25 mm cover will cost $2,500 and will last 2 years. A traditional cover will cost $1,000 and the Envelop cover will last 4 times longer. Ship maintenance will be reduced from 8 hours per week to 1 hours per week @ $15/hr cost. Traditionally, major maintenance is done every 2 years costing $30,000. With Envelop Protective Covers, major maintenance is done every 3 yrs at a cost of $30,000, saving $2,500 per year in allocated costs. The 25 mm platform is estimated to cost $463,000 and by extending the real life by 20%, the benefit is $3,800 per year.